The number of superlatives used to describe graphene is just too many. From the time it was discovered in 2004, researchers have observed that the honeycomb, lacelike sheet of carbon atoms, typically the most microscopic shaving of pencil lead one can visualize, is not merely the thinnest material in the world, but it is also hundreds of times robust when compared to steel, astonishingly flexible and light in weight, and more electrically conductive when compared to copper. At present, researchers at MIT and Harvard University have discovered that the graphene has even more intriguing electronic characteristics. In two papers reported in the Nature journal on March 5, 2018, the researchers have described the way graphene can be tuned to function at two electrical extremes: one as an insulator, where electrons are entirely prevented from flowing; and the other as a superconductor, where electrical current can pass through without resistance. In the past, researchers, including this team, were successful in synthesizing graphene superconductors by making the material to be in contact with other superconducting metals. This arrangement enables graphene to acquire specific superconducting functionalities. At present, the researchers have discovered a way by which graphene can be made to superconduct itself, showing that superconductivity could be an inherent property in the purely carbon-based material. The researchers achieved this by developing a “superlattice” of two stacked graphene sheets, not exactly on top of one another, but rotated very slightly, at a “magic angle” of 1.1°. 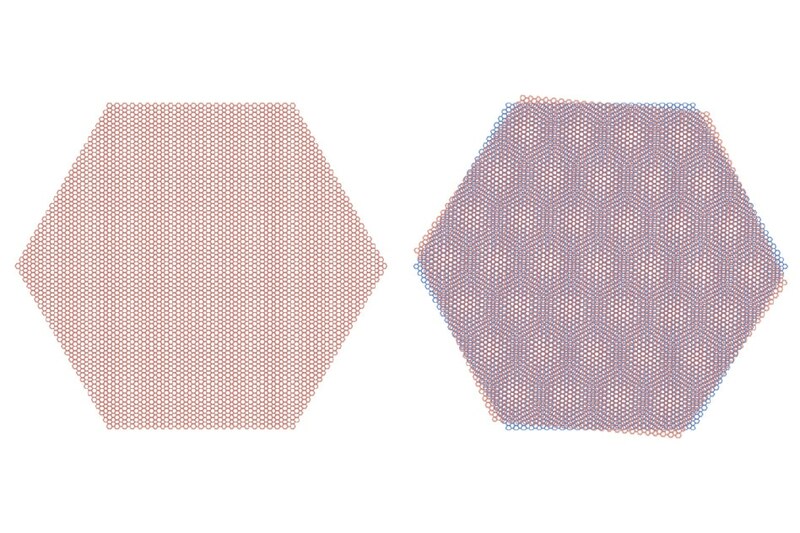 Consequently, the superimposed, hexagonal honeycomb pattern is slightly offset, forming an accurate moiré configuration that is estimated to produce strange, “strongly correlated interactions” between the electrons in the sheets of graphene. In other stacked configurations, graphene remains detached, interacting feebly, electronically or by other means, with its adjacent layers. The team, headed by Pablo Jarillo-Herrero, an associate professor of physics at MIT, discovered that when the sheets were rotated at the magic angle, they exhibit nonconducting functionality, almost identical to an exotic category of materials called Mott insulators. Upon applying voltage, which added lesser numbers of electrons to the graphene superlattice, the researchers observed that, at a specific level, the electrons escaped from the initial insulating state and started to flow without resistance, akin to flowing through a superconductor. We can now use graphene as a new platform for investigating unconventional superconductivity. One can also imagine making a superconducting transistor out of graphene, which you can switch on and off, from superconducting to insulating. That opens many possibilities for quantum devices. In general, a material’s potential to conduct electricity is represented in terms of energy bands. A single band depicts an array of energies possessed by the electrons in a material. An energy gap exists between the bands. So when one band gets filled, an electron must gain extra energy to cross this gap to occupy the subsequent empty band. For a material to be classified as an insulator, its last occupied energy band has to be entirely filled with electrons. In contrast, conductors of electric current (e.g. metals) have incompletely filled energy bands, including empty energy states which can be filled by the electrons to move freely. However, Mott insulators are a category of materials that seem to conduct electricity with their band structure. However, when evaluated, they function as insulators. Particularly, they have half-filled energy bands, but due to robust electrostatic interactions between electrons (e.g. charges with equal sign repelling one other), the material ceases to conduct electric current. The half-filled band gets typically divided into two miniature, near-flat bands, where electrons entirely occupy one band and leave the other empty, thereby functioning like an insulator. This means all the electrons are blocked, so it’s an insulator because of this strong repulsion between the electrons, so nothing can flow. Why are Mott insulators important? It turns out the parent compound of most high-temperature superconductors is a Mott insulator. Put differently, researchers have discovered a technique to regulate and control the electronic characteristics of Mott insulators to transform them into superconductors, at comparatively high temperatures of nearly 100 K. In order to achieve this, they chemically “doped” the material by using oxygen, where the oxygen atoms attract electrons out from the Mott insulator, creating more space for the flow of left out electrons. Upon adding adequate amounts of oxygen, the insulator starts behaving like a superconductor. According to Jarillo-Herrero, the precise manner in which this transition takes place has been a mystery for the past 30 years. Jarillo-Herrero and his team were on the search for a less complex platform to investigate such unusual physics. In analyzing the electronic characteristics in graphene, the researchers started working with less complex stacks of graphene sheets. They developed two-sheet superlattices by initially exfoliating a single graphene flake from graphite, and then cautiously collecting half the flake by using a glass slide covered with a sticky polymer and an insulating material of boron nitride. Then, the researchers very slightly rotated the glass slide and collected the other half of the graphene flake, attaching it to the first half. Thereby, they developed a superlattice that included an offset pattern different from the original honeycomb lattice of graphene. This experiment was repeated by the researchers, developing various “devices,” or graphene superlattices, with different rotation angles ranging from 0° to 3°. Each device was fixed with electrodes to measure an electrical current that passed through. Then, the resistance of the device was plotted, by using the amount of the original current that had passed through. At an angle of 1.1°, a rotation proposed to be a “magic angle,” the team discovered that the graphene superlattice was electronically similar to a flat band structure, almost identical to a Mott insulator where all electrons carry the same amount of energy notwithstanding their momentum. Imagine the momentum for a car is mass times velocity. If you’re driving at 30 miles per hour, you have a certain amount of kinetic energy. If you drive at 60 miles per hour, you have much higher energy, and if you crash, you could deform a much bigger object. This thing is saying, no matter if you go 30 or 60 or 100 miles per hour, they would all have the same energy. In the case of electrons, this indicates that even if they occupy a half-filled energy band, a single electron does not have more energy than the other electrons, for it to be able to flow through that band. Hence, although such a half-filled band structure has to behave like a conductor, in contrast, it behaves like an insulator, more accurately, a Mott insulator. The researchers got their concept from this: Imagine adding electrons to the Mott-like superlattices, the same way in which researchers doped Mott insulators with oxygen to transform them into superconductors. Will graphene consequently adopt superconducting qualities? In order to find this out, the researchers applied a small gate voltage to the “magic-angle graphene superlattice” by adding lesser amounts of electrons to the structure. Consequently, individual electrons got attached together with other electrons in graphene, enabling them to flow to spaces where they could not flow earlier. The whole time, the scientists continuously evaluated the material’s electrical resistance and observed that when a specific, small amount of electrons were added, the electrical current started to flow without dissipating energy, quite similar to a superconductor. “You can flow current for free, no energy wasted, and this is showing graphene can be a superconductor,” stated Jarillo-Herrero. Maybe more significantly, he stated that the scientists could tune graphene to function like a superconductor or an insulator, and any mid-phase, displaying all these distinctive characteristics in a single device. This is in contrary to other techniques in which researchers had to develop and regulate hundreds of individual crystals, where each could be tuned to function in only one electronic phase. The Gordon and Betty Moore Foundation and the National Science Foundation supported the study.